What do you give a graduate, groomsmen, corporate associate, or member of your family that he will use and appreciate? We recommend this polished nickel money clip! 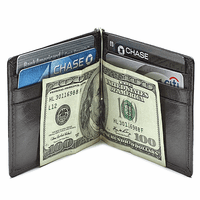 It holds 15 to 20 folded bills, along with a credit card or two, without the need for a heavy, bulky wallet! 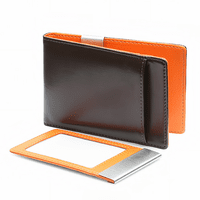 He will love keeping his money organized and easy to retrieve from a pocket when he needs cash! We will personalize the top face with his name or initials at no extra charge, and will package your money clip in a gift box that's ready to present!. 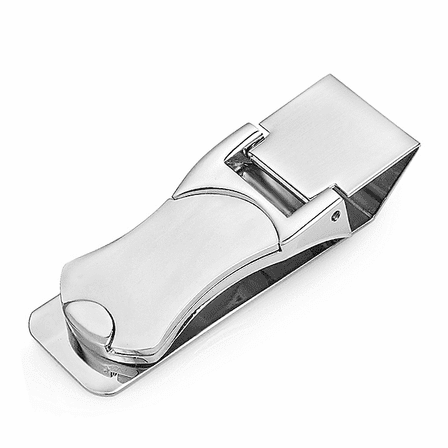 up to what thickness of items will this money clip comfortably hold? 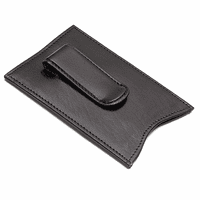 About 1/2" to 3/4" of bills and/or cards can be held firmly in this money clip. Very nice looking money clip. Came to the house in about four days. Nice looking, good quality, engaving is nice. price was good!